The “prime of his life” was age 33 and Field left with a comfortable fortune of $250,000—between $6 and $10 million today. But his retirement did not necessarily include "the rest" which the California journalist referred to. He traveled with artist Frederick Church through Bogota, Guayaquil and Ecuador. But he is best remembered for being the force behind the laying of the Transatlantic Cable in 1866. Field was also the owner of the Evening Mail newspaper. 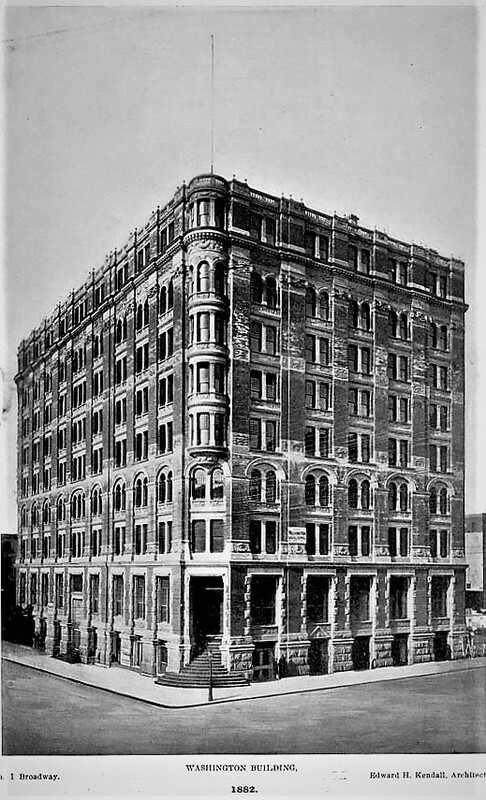 In 1881 he embarked on a project to erect a new headquarters building which would include additional floors of leased office space. 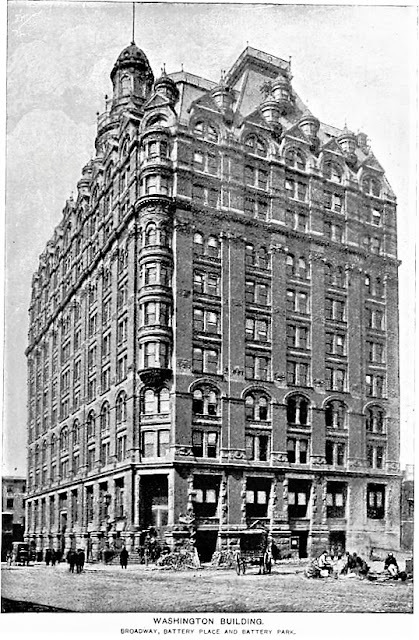 One by one he purchased the properties that composed the block front on Battery Place, between Broadway and Greenwich Street (today Trinity Place). Included was the historic Washington Hotel at No. 1 Broadway, built in 1745 as the mansion of British Captain Archibald Kennedy. On November 17, 1881 The New York Times explained that Field "decided that six of the foremost architects of this City should enter into a competition in the drawing of plans for the immense office building which it is his intention to have erected on that ground." The mere submission of a design would reap the architects $500; the winning architect would be awarded $5,000 (plus an additional $500 for relinquishing ownership of the designs to Field). The designs were to be submitted anonymously, marked with a "motto," accompanied by a letter containing the architects' names which would be opened only after the choice had been made. On November 1, the deadline, Field gathered up the plans, took this to his country home at Irvington-on-Hudson, and reviewed them with his wife. The couple decided on Edward H. Kendall. "Mr. Kendall's plan is to constructor a building that will in many of its details be a reminder of the old colonial days, and which will, to some extent, memorialize the building there standing and known to have been the head-quarters of Gen. Washington," said The Times. "The architect has, therefore, produced plans for a building, the style of which he is pleased to distinguish as colonial." While Kendall's design did include Colonial Revival elements, it also drew substantially from the new Queen Anne style. Faced in "Milwaukee brick," its brownstone trim was, according to The Times, "the same kind of stone used in the construction of Trinity Church." From the two main entrances at the chamfered corners rounded stone staircases spilled to the sidewalk like cascades. Both corners included five-story "turreted oriels." Even after Kendall filed his plans on June 23, 1882 it seems that he and Fields were still working out significant details. Although Field had initially put a $500,000 cap on construction costs, Kendall's plans came to $900,000--nearly $20.5 million today. And although the plans called for an 11-story building, The New York Times described 10 stories. Even at that height it would be a marvel. (In 1896 one writer called the building "the pioneer of the "Sky Scrapers.) The Times called it "an artistic effort" and predicted it "cannot fail to attract the eye, and it is believed that the building will be one of the handsomest in the City." The entire tenth floor, said the newspaper, would be used by the Evening Mail for its "editorial, reportorial, and composing rooms," and, of course, Cyrus Fields's office. The press rooms were located in the cellar, with windows at sidewalk level, at the western end of the building. The Broadway side cellar space would hold the safe deposit vaults of the banking firm which had already signed a lease for the first floor space on that side. Floors three through nine contained 19 rented offices each, which measured 17 by 18 feet. The Times commented "The offices on the Battery-place front will command an unsurpassed view of the Battery Park and the harbor." Among the first tenants were the Manhattan Hay and Produce Exchange, as well as D'Orville's restaurant, which would be the scene of business meetings and dinners. One example was the annual dinner and election of the Telegrapher' Mutual Benefit Association on November 19, 1884. The millionaires in evening clothes had come from as far away as Chicago, Baltimore and Philadelphia. The offices of the committee for erecting the Statue of Liberty moved in shortly after the building's completion. The frustrating task of erecting a base and assembling the monument had been dragging on since 1876 when the arm was first displayed in Madison Square Park. Part of the problem was that the United States had to pay for the pedestal. Americans were still reeling from the Financial Panic of 1873 and there was tepid interest in donating to the project. Periodicals were not quick to get behind it, either. Harper's Weekly declared that France should have paid for the entire gift; and The New York Times said "no true patriot can countenance any such expenditures for bronze females in the present state of our finances." But now the goal seemed within sight. In August 1884 the Broadway entrance of the Washington Building was draped in French and American flags in anticipation of the cornerstone laying ceremonies of Richard Morris Hunt's pedestal on August 5. A reception was held that morning from 10:00 to 1:00 and 3,000 invitations had been sent out for the ceremony. Only a year after the Washington Building was completed, Edward H. Kendall got his way. On July 18, 1885 The Record & Guide reported "Cyrus W. Field intends to add three stories to the Washington Building next year, to cost about $250,000. The addition will contain a tower and other features, and will be a continuation of the original design, which was to make it an eleven-story building. The architect will, of course, be E. H. Kendall." The Record & Guide called the remodeled structure "undoubtedly one of the handsomest office structures in the world." Not only did were the building's electric lights powered by its own dynamos in the basement, it had its own artesian well. The Guide concluded "It is probably the first building to attract the foreigner who comes to our shores, and it stands out prominently, both on land and water, as one of the noblest buildings at the extreme southern boundary of Manhattan Island." The Statue of Liberty Committee would not need offices after October 1886. But the group went out with a bang--literally. Previous to the monument's dedication on the afternoon of October 28, a procession came down Broadway to the Battery. That night fireworks were set off from the Washington Building. Cyrus Field had known Wall Street speculator James H. Hunting casually for years. A wealthy jeweler in the 1850s, he had lost his business through bad investments. By now he was considered "to be in moderate circumstances," as described by The New York Times. His marriage had ended in divorce and "after this Hunting seemed to grow less and less prosperous." Hunting routinely dropped into the offices of friends to ask for small loans. Among those was Cyrus Field and on May 4, 1888 he was back. He walked into Field's office in the Washington Building asking him to lend him a few dollars. Field reportedly replied, "Why, Jim, you know how this thing is; I have calls every day or two for money, and I can't lend you any to-day." Hunting laughed at the good natured rejection, handed Fields a note and said, "Read this tonight." The Times reported "Still laughing and in a perfectly cheerful manner, Mr. Hunting left the office. His steps sounded along the hall for a moment, and then the report of a pistol was heard. People rushed out of their offices and found Mr. Hunting dead." Dear Will: It seems almost impossible to succeed. As a last favor, will you send my body to Madison, N. J., for burial as cheaply as possible, as I have no other friend but you. Yours, Jim. A string of tragedies would personally visit Cyrus Field beginning in 1891. His beloved wife, Mary, died in their country home in November. Only weeks later his son, Edward, went insane. He not only brought about the failure of his brokerage firm, Field, Lindley, Weichers & Co., but "raided the strong box in which his father, Cyrus W. Field, kept his securities and left it empty of valuables," as reported by The Times on December 2. The two events seriously affected Field, who was reported bedridden and while "not unconscious" all efforts "to arouse him were not successful." And things got worse. A partner in the ruined Field, Lindley, Weichers & Co. was Daniel Lindley, the husband of Cyrus's daughter Grace. Now, stricken with "nervous prostration," Grace was taken to the Field mansion on Gramercy Park. She died there on January 11 and her funeral was held in the mansion. It was all too much for the 72 year old millionaire to handle. He never recovered and died in the Irvington-on-Hudson house in July 1892. 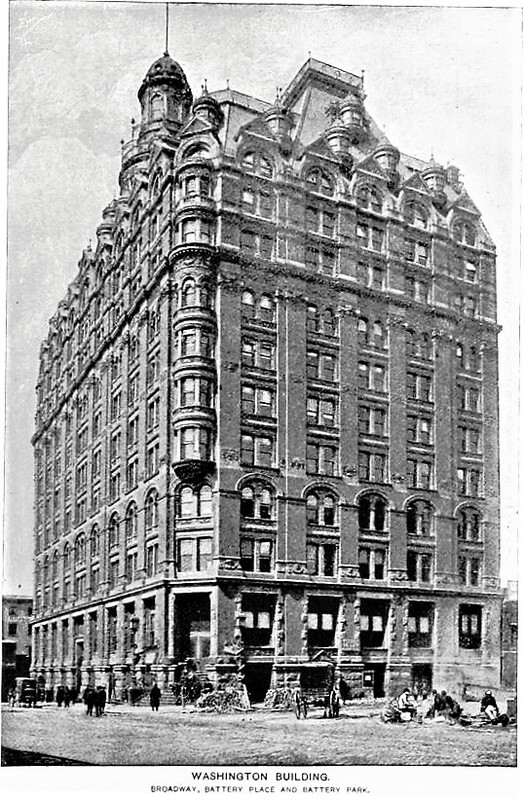 The Broadway building was purchased by the Washington Building Co. In January 1908 the firm hired Harry E. Donnell to so "extensive improvements." Although the plans are vague, the updates were internal and most likely involved issues like plumbing and elevators. Far more serious renovations would come after the International Mercantile Marine purchased by Washington Building in November 1919. The organization paid $3 million--more in the neighborhood of $42.5 million today. Only one week later it announced the structure "is to be transformed into a great white stone structure of classic dignity and proportion." Architect Walter B. Chambers told reporters "The cupola and the side turret windows of the present structure will be removed, simplifying and strengthening the outline of the new elevation. The interior will also be entirely remodeled in accordance with the most modern ideas." The remarkable make-over was completed in August of 1922. Astoundingly, the massive reconstruction of the building was executed without dispossessing the existing tenants--they were simply moved around as construction took place floor-by-floor. The entire first floor became the "great booking office" of the steamship company, as described by the Record & Guide. "This office was designed to represent the latest idea in practical utility, with extensive counter space, a large waiting room for customers, a department devoted to the issuing of travelers' checks and an information bureau." The Guide deemed the remodeled building "a beautiful harmonious structure, which few would recognize as the old Washington Building, known for two generations as the first skyscraper in Manhattan." The design won the The Downtown League's "first [place] award for an altered building" in January 1922. 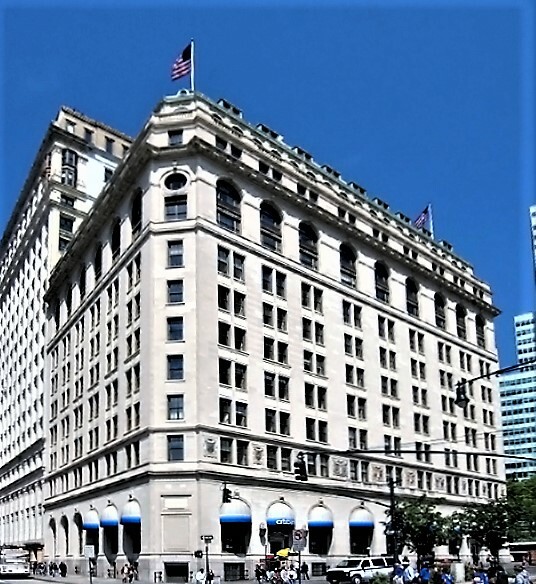 In announcing the award, the League said it "covered their beautiful building at 1 Broadway, formerly known as the 'Washington Building.'" 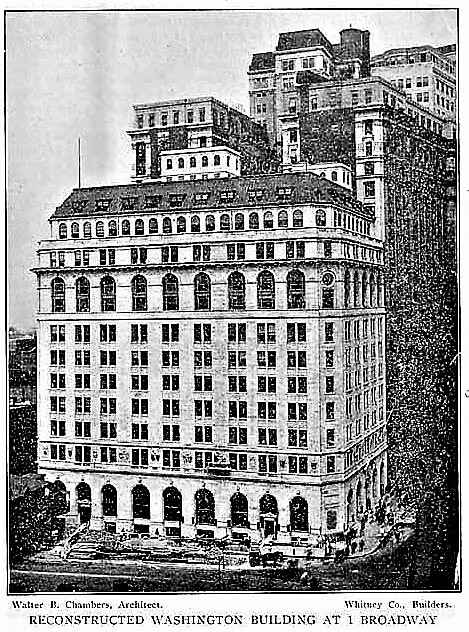 The International Mercantile Marine Company had barely opened its offices at 1 Broadway when it became involved in a sticky international problem--Prohibition. Passengers on elegant steamships heading to New York from Europe expected wine with dinner and, perhaps, a cocktail in the evenings. But Attorney General Daughtery ruled in October 1922 that "no ships may enter American waters with liquor aboard." The ruling was immediately protested by the Cunard Line, the Anchor Lines, the United American Line and Red Star Line. On October 12 the International Mercantile Marine Company joined the others in challenging the ruling. The day before the ruling became effective passengers of the United American steamship Resolute "entered port singing lugubriously 'How Dry I Am,' the ship's bar having been closed at sea," reported the New-York Tribune. on October 13. The Government was given a temporary restraining order by Judge Learned Hand until the United States Supreme Court could rule on the scope of the 18th Amendment with relation to international ships. In 1992 Allstate T. F. I. acquired No. 1 Broadway in foreclosure. Over the decades the stone facade had weathered and fragments have fallen away. 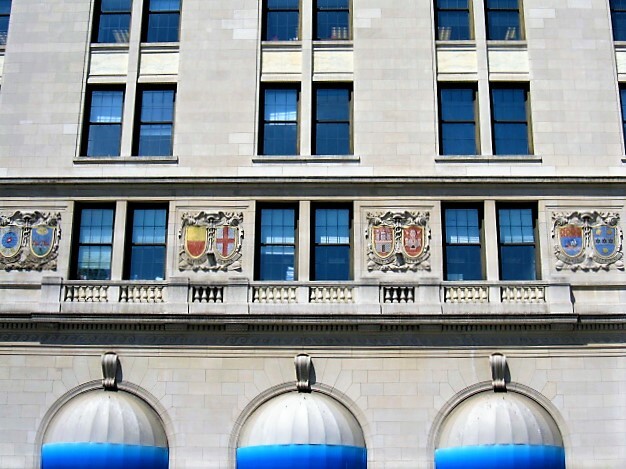 The firm initiated a $2.2 million facade restoration by architect Stephen Cohan, executed by C. & D. Restoration. Interestingly, as damaged stone was removed, the original brick and brownstone facade was revealed underneath. Completed in 1995, the project was awarded the Lucy G. Moses Preservation Award by the New York Landmarks Conservancy.